The progress on the diabetes front, or lack of it, is a source of serious frustration for David Thomas. Especially given the role he played in the design and implementation of new technology. Thomas was diagnosed with viral-onset type 1 diabetes when he was three years old, and by the time he was 11, was testing the first generation of insulin pumps. An uncomfortable and unusually heavy behemoth that limited his activity levels severely during the three years he used it. “It was horrible,” said Thomas, who initially spent three days attached to a contraption similar to a dialysis machine to determine his basal insulin rate. That was less traumatic than what followed. He was connected to a brick-sized pump via a butterfly infusion set with a 1 1/2 inch long inflexible needle. It caused constant pain as well as infections at the insulin injection site. Over the next three years, he went through three different sized pumps, and though they became less unwieldy over time, the infusion set never changed. That was the most pressing problem with the pump. A competitive boxer who used the ring to take out aggression and ease the stress that comes with diabetes made his symptoms significantly worse. Thomas had to give up a sport he loved, until he finally ditched the pump and his experimental role in its development. “I realized I was not getting any better from this,” said Thomas, who had mastered the delicate balance between insulin, food and exercise during his years in the ring. No fan of team sports, he started boxing at six or seven, and was hooked. “It seemed a good way to focus my energy,” he said. While the pump brought his training to a halt, stomach cysts and oversized equipment made boxing impossible. After he returned to injecting his own insulin, he was able to return to the ring competing at Silver and Golden Glove amateur level. While boxing at an early age, Thomas never intended to go pro. His senior year of college a drunk driver collided with his motorcycle. After this episode, Thomas was hesitant to try another insulin pump. His childhood scars on being on a pump ran deep. It wasn’t until David met an executive from a tech company who was flying home from the UK, that he reconsidered going on a pump. This time it was the OmniPod. He calls his new pump “the best thing since sliced bread, “ and is hopeful for a future generation, which will check blood sugar levels and adjust insulin accordingly, acting like a true artificial pancreas. Thomas does laments on the exorbitant costs of living with diabetes, as well as the lack of research directed toward advancements that could lead to a cure. A move that would erase not only diabetes, but also the devastating complications that inevitably accompanies the disease. “Complications are inevitable, based on control,” says Thomas, a husband and father of two daughters, ages 19 and 4. “But every diabetic will succumb, because eventually you can’t outrun them. I’m just trying to stay ahead of complications”. Why doesn’t anyone address the huge price increase in pumps over the last decade? 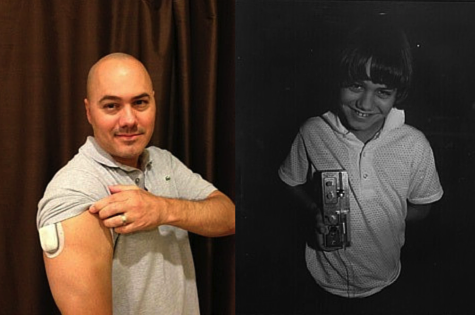 My original Medtronic Paradigm pump 10 years ago was approx. My insurance, Kaiser, paid 80%, so my share was less than $1,000. Today, an equivalent model is between 7and 8 thousand dollars. Kaiser now only pays 50%. And the state of the art model with CGM is well over $10,000. My pump is well out of warranty. If/when it breaks down, I will not be able to afford a new one. My pump allowed me to achieve very good control and made it much easier to manage my diabetes. It will be a huge setback to return to multiple daily injections. Why, instead of the prices dropping as usually happens as new technologies come into greater use, pump prices quadrupled or increased even more.